What warehouse are you looking for? CBRE, the global leader in the commercial real estate services sector, has issued a study monitoring the development of the demand for automotive suppliers in the Czech Republic. The study points out that many existing regions that are currently popular due to their proximity to the automobile manufacturers are not sufficient to satisfy the demand for automobile suppliers, which has reached record levels in 2015, forcing them to search for new places to locate their production. The automotive sector made up almost one-third of inquires carried out for production and storage areas in the first half of the year. In addition, according to CBRE, this sector requires large spaces for rent this year. 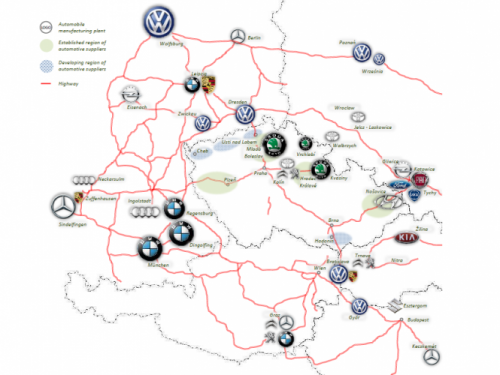 The largest centres of the automotive industry in the Czech Republic are Mladá Boleslav, Plzen or around the TCPA in Kolín and the Škoda Auto factory in Kvasiny, among others. Investors are becoming interested in new locations in North Bohemia or Moravia because existing industrial zones are largely occupied already.